Powers: Storm has the ability to mold the earths weather patterns to her will. effects such as tornadoes, storms, hurricanes and hail are just a few of the things she can accomplish with her powers. By tapping into the weather patterns of earths she can channel the elements through her body as well. She can also view the world in terms of energy patterns and can sense disturbances in nature. Storm is also able to fly by having the air carry her. This control is dependent on her will and strength of her body. Due to her powers she is immune to temperature extremes. She can also mold her lightning into a lightning lasso which once ensnared compels those caught to speak the truth. Tossed by a horrific Storm into the churning Atlantic, Ororo was rescued by Queen Hippolyte and taken to the island of Themyscria. 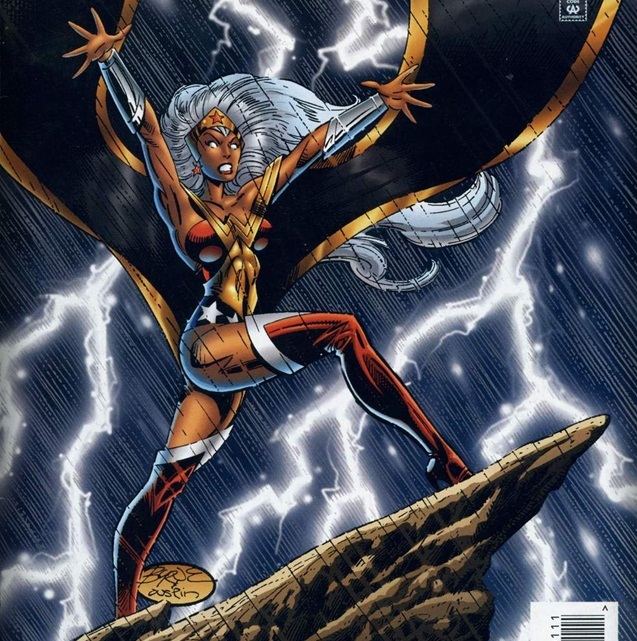 Raised by Amazons there, Ororo grew into her mutant weather-manipulating powers while also learning the ways of the woman warriors. As the adopted daughter of the Amazon Queen she clashed constantly with Diana the queen’s real daughter. Returning to the U.S. as Themyscria’s champion, she has made a new home in Baton Rouge. She was approached by Marco Xavier to help found a group of mutant heroes, but she wanted nothing to do with any group headed by a man. Her “sister” Diana followed her to man’s world where she wed Vigilante Castle much to their mother’s dismay. Years later she would learn that her father’s death was a result of the vengeful god Poseidon destroyed their ship, ororo was the sole survivor. Kind of strange to consider Ororo as an amazone ?